W H A T E V E R ! Have a nice day. So, as a follow-up to the recent thread about Dana Delany in a new program called *The Code*... Has anybody seen the show? And other than Ms Delany being in it, is it worth watching...? Sheesh, I dunno what Hornady has been up to recently. I have been loading 38 Special, 38-40, 44 Special, and 45 Schofield for years on my Lock & Load AP. with standard Hornady dies. There were no special 'cowboy' dies, just one set does all. For 45 Schofield I use the Hornady 45 Colt die set, with the seating/crimp die screwed down far enough for the shorter Schofield case. I can't even find most of those calibers on their website now. I've seen those things for sale in novelty / specialty catalogs. Never much cared how it was done. I have other things to keep me occupied. Shotgun Belt With Buckle In Front? I can’t see Wayne or Eastwood wearing a shotgun belt either. Especially when it turns into a bra like so many do. If you want to go that route, 45 Schofields will fit just fine in a New Vaquero cylinder. Ruger got smart when they made the New Vaquero cylinder. If you look closely at the photo above you will see the area of the ratchet teeth is scalloped slightly, making more clearance for the rims. With the 'original model' Vaquero cylinder, shown in the photo below at the left, the ratchet teeth were cut from a cylindrical drum, and there was less clearance for the rims than in a New Vaquero, even though the New Vaquero cylinder is smaller in diameter. I had one chamber on my 'original model' Vaqueros that would not accept the wider rims of the Schofield round. Nominally .520 vs .512 for the 45 Colt rim. I had to file a little bit of clearance on that cylinder for the one chamber that would not accept the Schofield rim. So when they came out with the New Vaquero Ruger took a page out of Colt's book and scalloped the area around the rims, somewhat like the Colt cylinder on the right in the photo below. When I was on Okinawa before We gave it back to the Japanese, there were hundreds of little three wheels Mitsubishi trucks on the island. Underpowered two and four cylinder two stroke engines and a two speed semi-automatic transmission. One was turning east off of Highway 1 onto Highway 5 below Kadena AFB and the road became fairly steep. He was carrying three twenty foot wooden telephone poles strapped up over the cab and sticking our the back about ten feet behind the cab. The weight shifted and his front wheel left the ground and the poles were dragging on the pavement behind. He didn't have the horse power to drag them and couldn't unstrap them so he simply got out, caught a cab, and left. Traffic was all bollixed up so I did a U turn and went home another way. Still sounds easier than getting parts for my CZ coach gun and I wouldn’t hesitate to buy another if I had reason too. I’ve heard more positive stories about parts for Miroku 73s than negative ones. I ain’t skeered. I was an English teacher and thought about writing a couple of books entitled A More Better Way To Gooder Inglish and What College Lerned Me. I really upset a professor when I was in college. She was carrying on about where people are getting "where it's at". I raised my hand and when she called on me I said" Don't worry about it Doctor Jarvis. Most of us don't know where it's at either." Later on she told me that after supper she told her husband about and he cracked up. Then she got it. That’s who invented it. Mexicans. (V)Baca = Cow Quero = Boy Anglized Its “Buckaroo”. A V is pronounced B in Spanish. 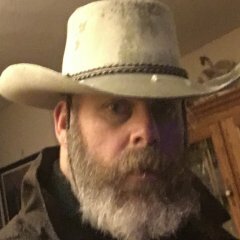 Howdy I discovered a long time ago that if I leave about 1/4" of space between the rear of the trigger guard and the knuckle of my middle finger, I will not get my knuckle whacked in recoil. You are already part way there if you are curling your pinky under the grip. Doing so shifts your grip down enough that the gap opens up between the trigger guard and your knuckle. This is the way I shoot my Colts, and they are basically the same size and weight as a New Vaquero. Examine your grip technique and see if you can open up the gap. Do not leave your knuckle in contact with the trigger guard, that will hurt. Grasp the gun firmly, but not with a death grip. Allow the recoil to raise your forearm up to absorb the recoil. 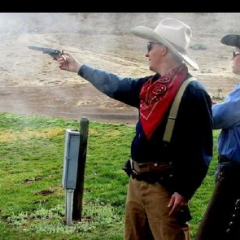 I can shoot my Colts this way all day long with a case full of Black Powder under a 250 grain bullet. Recoil is stout, but I have not gotten my knuckle whacked in years. Whole heap of Mexicans, too, especially in the south west United States and territories. Paulo, it is now back to being page 1 material. We owe them a tremendous debt of gratitude. Howdy 250 grain Big Lube PRS bullet, and 2.2CC of FFg. Works out to around 33 grains. I like Schuetzen the best. It is the same stuff as Graffs, just a different label on the bottle. Bass Reeves was one of the best. Even arrested his own son. It has been 10 years since production moved from CT to NY. I figure they have their production/quality problems ironed out by now, so I jumped on a new 1894CB. These are scarce, so I grabbed the first one I could find at a decent new price. The quality of wood in mine is certainly a step above what they show in the web site photos. ALL items have been SOLD...Thanks for looking my friends! !